The beeeep! beeeep! 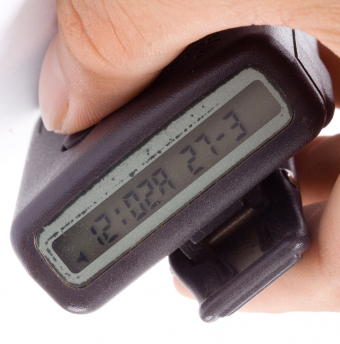 of someone’s pager going off used to be everywhere… but when was the last time you heard one? Let’s take one last look before they’re gone forever. In 1924, a New York City businessman named Sherman Amsden started a company called the Doctors’ Telephone Service, one of the very first answering services in the country. When a physician was out of the office, his calls could be automatically forwarded to the service, whose operators took messages for him to retrieve when he called in later. The service was simple but much needed. In an era before voice mail or even answering machines, the only way to be sure an important call didn’t go unanswered was to sit by the phone and wait for it to ring. For doctors, a missed call could mean the difference between someone’s life and death, and being on call often meant being stuck at home within earshot of the phone for hours on end. Or at least it did until Amsden’s company let them pass that chore off to someone else. Now doctors could get out of the house, as long as they checked in to see if they had any messages. Amsden’s business thrived; it did even better when he renamed it Telanserphone so that he could market the service to plumbers, undertakers, elevator repairmen, and other people who were needed in emergencies. By 1939, he had thousands of clients and more than 60 operators staffing switchboards all over the city. But as the calls poured in and messages piled up, Amsden noticed that many clients—including some doctors—didn’t check for messages as often as he thought they should. That got him thinking: Why should they have to call in at all? They ought to be able to carry around a device that told them if they had messages waiting. Amsden thought a “radio-pager” would do the trick. It would be a device similar to an AM radio but locked onto a special frequency reserved just for pagers. He imagined his pager as a bulky piece of equipment, one that the client might wear over the shoulder or around the neck using a strap, or hang from a knob on the dashboard of a car. When it received a signal indicating that the client had a message waiting, a buzzer would sound or a light would flash, telling the client that he needed to call Telanserphone’s operators to get the message. That was the idea, anyway. But to make it work Amsden actually needed his own radio station. That required the approval of the Federal Communications Commission, which would also have to agree that using a radio station solely to signal pagers was a good idea. The FCC considered Amsden’s request…and considered it… and considered it, taking a full ten years before it finally said yes. While Amsden was waiting for the FCC to make up its mind, he hired an inventor named Richard Florac to design the pager. Florac came up with a design smaller than Amsden had envisioned—about the size of an eyeglass case and small enough to fit in a pocket. But it didn’t have a buzzer or a flashing light. Instead, the pager had a tiny built-in speaker that clients held up to their ear, much like a person holds a cell phone today. Each client was given a unique three-digit identity code, and this was what they listened for. Whenever a call came in to Telanserphone, the operators would broadcast the code over the air (along with the codes of every other client being paged, up to 60 codes at a time). The client had to listen to all of the codes being broadcast to see if his was among them. Telanserphone’s radio transmitter was located atop the 42-story Pierre Hotel on 5th Avenue in midtown Manhattan. That gave the system a 30-mile radius—enough to allow subscribers to check for messages from just about anywhere in the city. The pager worked almost everywhere (except on the subway), even inside buildings and cars. Cost of the service: $11.50 per month, the equivalent of about $100 a month today. Not cheap, but if you had the money, it was better than being stuck at home by the phone. The system went into service on October 15, 1950, and sent out its first page later that same day to a physician playing a round of golf 25 miles away. A year later, Telanserphone’s pager division had more than 400 subscribers. Telanserphone’s pagers weren’t “beepers.” They didn’t beep because there was no way to signal one pager without signaling all the other pagers at the same time. But by the time the company’s system was up and running, another inventor, Al Gross, had patented a pager that could be signaled individually. Gross didn’t conceive of his pagers as something that could be used all over a city. Instead, he saw them as a less noisy alternative to a hospital’s public address system. As we told you in Uncle John’s Curiously Compelling Bathroom Reader, pagers were an outgrowth of radio-controlled bomb detonators he’d developed during World War II to blow up bridges in Nazi Germany. After the war, he reworked the system to send signals to pagers instead of bombs. More than 20 years passed before a company called Motorola took Sherman Amsden’s concept—pagers that worked all over a city—and married it with Al Gross’s idea of beeping pagers that could be signaled individually. Introduced in 1974, the Motorola Pageboy was the first commercially successful beeping pager. Like Telanserphone’s pagers of the 1950s, the Pageboy was little more than an extension of an answering service. Since beeping was the only thing it could do, the user still had to depend on live operators to take messages and relay them over the phone. Technological improvements over the years eventually eliminated the need for answering services and live operators entirely. These included numeric displays that showed the telephone number of the person calling, electronic voice mail, alpha-numeric displays, and Internet connectivity (once the Internet came into widespread use) that made it possible to e-mail messages directly to pagers. Satellite-based paging systems expanded coverage from a single city to much larger geographical areas, even nationwide. The plunging prices of pagers and service plans caused sales to soar in the 1990s. By 1994, more than 14 million Americans owned pagers; five years later nearly 60 million did. A third of these were for personal (not business) use, and with service plans as low as $15 a month (with the pager thrown in for free), even teenagers could afford them. Kids loved them because their favorite hip-hop stars had them, and pagers actually became a popular high school fashion accessory. But the same forces that created the pager boom sent it into a tailspin just a few years later, when steadily dropping prices and ever-expanding features of cell phones caused pager owners to trade up by the millions. By 2000, the number of pager owners in the United States was down to 37 million, a decline of nearly 40 percent in just two years. In 2002, even Motorola, which invented the modern pager business and controlled 85 percent of the American market at its peak, stopped manufacturing and servicing pagers. By 2008, there were only 6 million pager subscribers in the U.S., a nearly 90-percent drop since 1999. That year 255 million Americans owned cell phones. Today, while pagers still exist, the number of pager subscribers continues to decline and it’s quite possible that the last remaining pager networks will eventually fall silent. Can you remember the last time you heard a beeper beep? If not you may be out of luck—there’s a good chance you’ll never hear another one again.